When it comes to smart grid trends, fast is the new smart. That’s one way to take a string of announcements from smart grid vendors over the past two weeks, launching various smart grid products that include a speedy delivery guarantee. The latest comes from Silver Spring Networks, the startup that’s keeping the smart grid industry on its toes awaiting its long-promised, yet to be delivered IPO. On Thursday, the Redwood City, Calif.-based company announced its “Speed-to-Value” program -- essentially, a promise to lend its technology and service expertise to utilities wanting “easy-to-implement offerings” for distribution automation, fault location, load control, and conservation voltage reduction. That’s a short list of some of the most common distribution grid functions being offered by companies like General Electric, Siemens, Schneider Electric/Telvent, ABB/Ventyx, Alstom, Eaton/Cooper Industries, S&C Electric Co., and a whole host of smart grid contenders. Most of these projects use SCADA systems to communicate, but Silver Spring, with nearly 10 million smart meters networked at utilities across the country, wants to expand its wireless network and its endpoint-to-utility control room software from simply metering to all sorts of different services like these. This stuff isn’t new to Silver Spring. It’s already doing distribution automation in Department of Energy-funded projects for utility customers like AEP and FPL, and recently announced it was integrating with Virginia energy company Dominion’s Edge platform. Likewise, on the demand response and home connectivity front, it’s connecting thousands of smart thermostats to peak-shaving pricing plans for Oklahoma Gas & Electric, in one of the country’s first commercial-scale deployments of home energy management via smart meters. Last week, it launched its “Direct-to-Grid” program, aimed at delivering direct monitoring and management of energy intensive assets such as air conditioners, electric heaters, water heaters, and pool pumps. But these are first-of-a-kind pilot projects, and have taken a year or more to bring online. Silver Spring’s new offering is meant to accelerate that deployment schedule to months, though the company didn’t give specific timetables for how fast its Speed-to-Value program could get a customer up and running. But Silver Spring is also offering self-contained software packages to roll out these services, built on its UtilityIQ software platform, which is already supporting distribution automation and utility-to-home connectivity, as well as integrating into a long list of partner platforms, the most recent being eMeter. Silver Spring is tapping into an industry-wide trend toward simplification, modularization and speed in smart grid deployments. Last week, SAP launched its “Rapid-Deployment” program, which promises to tie a utility’s transformer monitoring systems into a back-end analytics suite in seven to ten weeks, to name one example. Silver Spring’s smart meter competitors (and sometime partners) like Itron, Elster Landis+Gyr, Aclara and Echelon are also building more grid-supporting functions into their smart meter networks, with a key goal being to improve future interoperability. Itron and Elster have partnered up with Cisco to integrate their smart meters with Cisco’s smart grid networking expertise and equipment, and Elster and Landis+Gyr share each other’s radios, to name a few examples. Likewise, the IT vendors that supply the smart grid with its servers, storage and networking gear are putting together modular, “utility-in-a-box” type offerings with various partners, aimed at delivering a set of functions in a pre-integrated package. Infosys is working with SAP and Oracle on a utility-in-a-box product that comes in the form of a hardened IT box on a cart and an Infosys expert on hand to install it, and Cisco and NetApp are deploying similar packages for data center energy management, to name a few. While Silver Spring declined to comment on which IT partners it was working with on its new speedy-delivery service, strategic investors like Hitachi ($30 million) and EMC ($24 million) both do work in smart grid IT. As for the value of speed-to-market, Silver Spring cited cost reductions and faster revenue generation as key drivers. 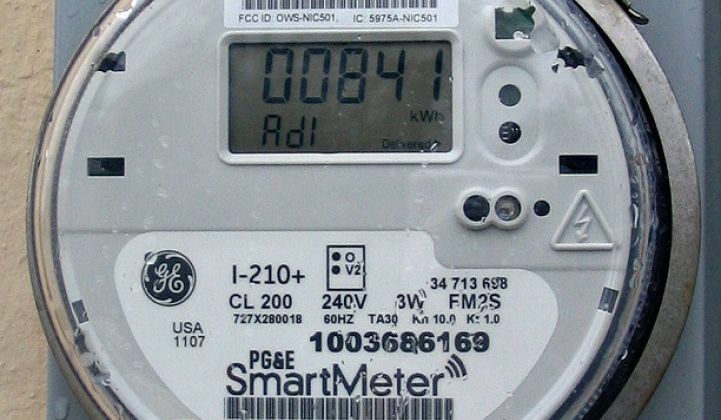 While the company didn’t add regulatory pressure, it could have: utilities around the country are under fire from state regulators that want them to prove their hundred-million-dollar-plus smart meter deployments are creating the benefits for customers that they promised. Recall that an Oracle survey earlier this year found that nearly half of utilities that have deployed AMI to date haven’t implemented a meter data management system, let alone the more complex IT that would allow them to use meter data for business processes and analysis, or operations processes like outage notification and power quality monitoring. The main reason utilities gave for lacking software to back up their AMI hardware was time -- for earlier-stage projects, many just hadn’t gotten there yet. Undoubtedly Silver Spring will be trying to up-sell its existing utility customers with smart meter networks on services like these. Most of its deployments are with a few key U.S. customers like Pacific Gas & Electric, Pepco, OG&E, Commonwealth Edison and Progress Energy, though the 10-year-old company is also branching into international markets, with a presence in Australia since 2009 and more recently in Brazil and New Zealand. Its S-1 states that it wants to expand those networks to support more and more revenue-generating services, including plug-in electric vehicle charging and, potentially, solar panel monitoring. Silver Spring has raised just under $300 million to date, and its June 2011 S-1 declared the intent to raise as much as $150 million on the Nasdaq, for a valuation that reports at the time said could be as high as $3 billion. The company has repeatedly declined to comment on its IPO plans.